Sigismund III Vasa (Polish: Zygmunt III Waza; Lithuanian: Žygimantas), b 20 June 1566 in Gripsholm, Sweden, d 30 April 1632 in Warsaw. 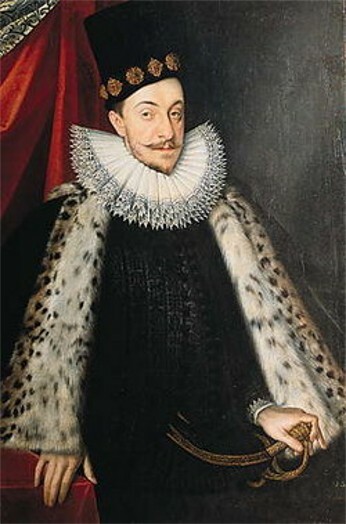 (Portrait: Sigismund III Vasa.) Grand duke of Lithuania and king of Poland (1587–1632) and king of Sweden (1592–9); son of the Swedish king John III Vasa and Katarzyna, the daughter of Sigismund I the Old. He was a zealous Catholic, and during his rule the pivotal Church Union of Berestia was signed (1596). He transferred the capital of Poland from Cracow to Warsaw. He supported the Jesuits and tried to suppress the Orthodox church in Ukraine. The restrictions placed by Sigismund on the Cossacks sparked rebellions led by Kryshtof Kosynsky (1591–3), Severyn Nalyvaiko (1595–6), and Taras Fedorovych (1630). The strength of the Cossack armies grew and resulted in the first clashes of the Polish-Cossack wars. Sigismund briefly held Moscow during the Time of Troubles (1610–12). In his wars against Turkey, particularly in the Battle of Khotyn (1621), Sigismund enlisted the aid of the Cossacks, led by Petro Konashevych-Sahaidachny.